Addicted to watching “Cake Boss” and its entire sister cake-decorating shows? Wish you could create similarly gorgeous, intricately decorated desserts? You can, but with a twist that will truly set you apart from the crowd. Cake decorations that feature candied flowers combine the beauty of real blossoms with the deliciousness of sugary sweets. And the technique is easy. 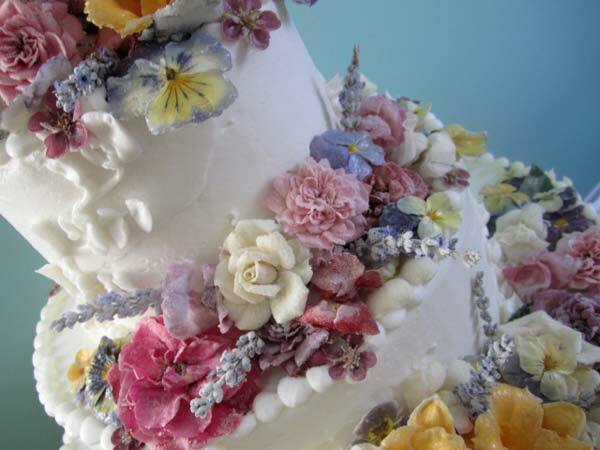 Decorating with sugar-frosted flowers isn’t new. The practice was popular as early as the 18th century. Today, however, interest has been renewed with the popularity of bakery-inspired specialties. And for anyone who already loves flowers, the combination is that much more irresistible. Most people’s first impulse with a rose is to sniff it—not to bite it. But roses, along with a wide and abundant variety of flowers, have a delicate flavor that pairs well with a sugary coating. Specifically, edible flowers include: calendula, carnation, chrysanthemum, English daisy, gardenia, gladiolus, hibiscus, hollyhock, honeysuckle, impatien, jasmine, lavender, lemon verbena, lilac, marigold, nasturtium, pansy, primrose, snapdragon and violet. In purchasing posies, ask your florist for organically grown plants. If your florist doesn’t have pesticide-free flowers in stock, he or she can special-order them from farms that follow chemically free practices. 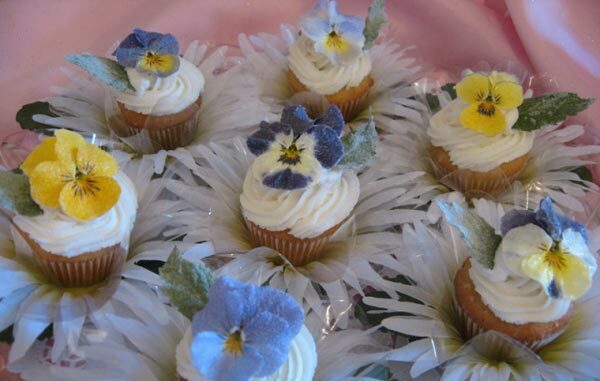 You can also find edible flowers in many specialty grocers’ produce departments or online. The supplies required for creating crystallized concoctions are simple: egg whites, sugar (regular, colored or superfine) and a small paint brush. Dip the brush into the egg whites. Holding the blossom just under the flower head, lightly brush egg white onto each petal and all other parts onto which you want the sugar to adhere. Don’t use too much egg white or the petals will become heavy and droop. Hold the flower over a plate and sprinkle the sugar on it. Recycle the excess sugar that falls onto the plate as it collects. 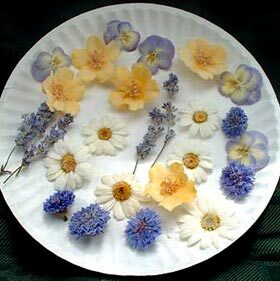 Place each blossom onto a flat surface, such as a cookie sheet. Allow the flowers to dry, for overnight or longer, depending on the size of the blossom. To store, stack the dried blossoms in an air-tight container with sheets of baking parchment between each layer. While stored flowers can last for up to two months, they will taste and look their best if you use them within several days of creation. 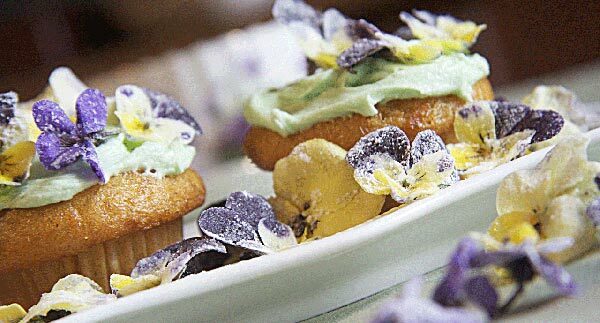 Use your sugar-frosted flowers to decorate cakes, cupcakes and other desserts, as well as in high-end cocktails for special occasions such as a Mother’s Day brunch, bridal showers and weddings. And be prepared for requests to make some for your friends, because the unique beauty of these crystal creations is likely to inspire lots of interest. Do you coat the backs as well as the tops? These are just beautiful. I do believe you coat both sides. You could probably try coating just one side, but the weight of the sugar may require both sides to be coated to keep the flowers stiff without folding. Experiment and then let us know how your experience was!